Few cities of our size in America have earned the reputation that Petaluma can claim. We have gone from being one of California largest cities (1860s) to the World's Egg Basket (early 1900s) to Telecom Valley, the thriving economic and progressive community we are today. Though the origin of the name "Petaluma" has been debated, it's now generally accepted to mean "flat back," from the language of native Americans in the area more than 5,000 years ago, and interpreted to mean mesas or hills within the valley 'Valley of the Little Hills," or 'City of Little Hills" is often used as a translation for Petaluma. Whatever its name, Petaluma natural wealth has attracted mankind since prehistoric times. For more than three thousand years, the Coast Miwok Indians lived off river and marshlands. In 1846, three Spanish land grants were established along the Petaluma River, and the area flourished as an economic and social center until gold was discovered in 1848. With the surge of gold miners to California, the Petaluma River became the major source of wild game to supply a growing population. In 1851, hunters set up camp at what is now Petaluma, and soon wild game was the main export from the area. The city was founded in 1852 and chartered in 1858, becoming a thriving shipping and manufacturing center. For 98 years, the waterway contributed to Petaluma's commercial success, making it at one time the ninth largest municipality and the third busiest inland port in California. Once the transport for miners and gold from Sacramento to San Francisco, relics of the two most remembered paddle-wheelers, the steamers "Gold" and "Petaluma," are displayed in the Petaluma Historical Library and Museum. From the 1880s through the 1940s, Petaluma became famous as a poultry town and was known as the "World's Egg Basket." Petaluma was home to the world's only Chicken Pharmacy (as featured in National Geographic and Ripley's Believe It or Not). Great wealth was accrued during this period and is still evident in commercial buildings and homes from that time. By the late 1940s, high costs forced thousands of chicken farms into the hands of a few large producers. 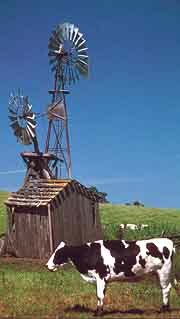 In the 1950s, dairy farming and the charm of country living made Petaluma what it is today Dairy is still a principal industry now, along with a variety of specialty agricultural products, high tech industries including telecommunications, and tourism.